Onyx has found a home! I took the picture above the last day Onyx was at our house. I was sitting on the computer and as usual she followed me and just dropped on the floor facing me. I thought she looked adorably cute resting her head on her front paws. Onyx has officially found a home. A friend’s coworker took her for the weekend and they got along well. She spent the whole last week with her new daddy. I missed her very much the night that she left us. She has such a huge presence. I missed cuddling with her when readying and the little cute noises that she made while having doggy dreams. Yet, at the same time, I was glad that she was gone because Indi was having such a hard time as she was totally withdrawn. But what matters is the fact that she has found someone to love her. I can’t imagine anyone not falling in love with her. I know I did!!! 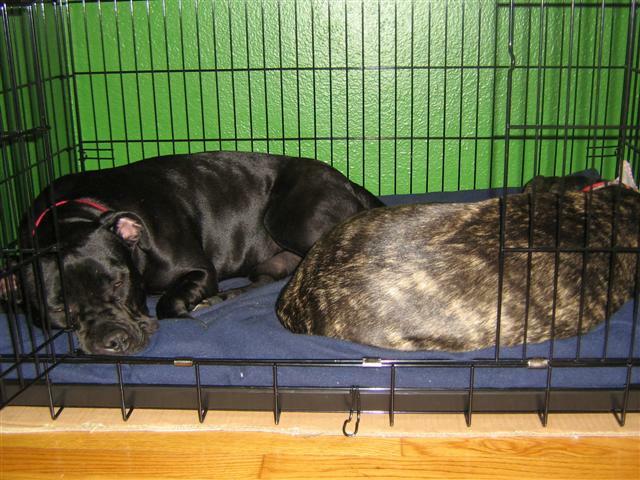 Both Onyx and her new daddy are lucky to have each other. So now things are back to normal in our house. Indi is normal again and she actually spends more time lounging in her favorite spot in the living-room. Both J and I are so happy that we were able to rescue her and find her a home. We were glad that we were able to offer her some shelter, especially when it rained hard during the time she was here, food, and love. It has been really nice for the past couple of weeks to have rain. It is such a welcome change and every time I hear the sound of rain it just makes me sooooo happy. I am a rain lover; quite to the contrary I am a totally sunny person. I usually hate gloomy and rainy days because I am one of those people who’s mood is affected by the weather. As a matter of fact, I don’t know if I could survive in cities such as London or Seattle for more than a few days. The only reason I get so happy when it rains nowadays is because we needed it so badly in Southern California. It has barely rained for the past two winters and the results have been rather damaging to our mountains and forests. It breaks my heart when we go hiking and everything is dry and brown. Even cacti plans look all dehydrated and dying. I love the crispiness of the air after a good rain, when the air is clean and the usual city smog is gone for a couple of days. It makes me happy every time I step outside and see grass growing and flowers blooming in places where there was nothing much before. It is heartwarming to see earth coming alive through various types of plants. A couple of days ago we went on a short hike down by the coast. It was still cloudy after the rain, the trail was a bit muddy, and it was a little chilly by the water. The ocean was calm and the sound of the waves crashing onto the beach was very soothing. There was no where else I would have wanted to be. It was nice to take the dogs for a walk and discover this new trail together. I love the fact that we live on a side of town where we can go hiking or just walking around. It is nice to not have to drive far in order to get some exercises. Today we went back to this awesome trail with my friend Barb who came down to visit. This time we went further out, beyond the golf course, and walked down to a semi sandy beach. 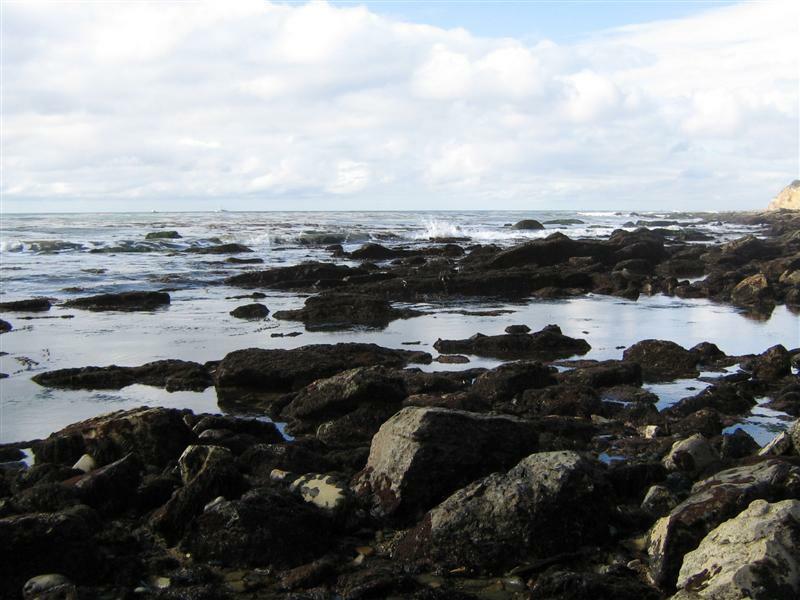 Most of the beaches in PV are all rocky. So it was nice to be able to walk on a beach that was not too rocky. It was a beautiful and warm day, the sky was blue with a few clouds over the water, the sun was shining and it felt good to absorb the warm rays. The ocean was the most beautiful shade of blue with silver sparkles where touched by the sun. I had a wonderful time chatting with my dear friend and catching up since we had not seen each other for the past three months. After our hike we went for a bite at Rex Café. Indi came along and it was so nice to sit in the outside patio area to eat and chat some more. 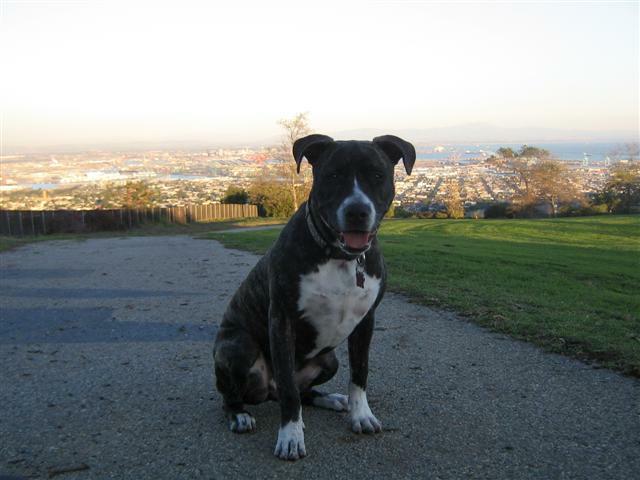 The ironies of life…on my last post I ranted a little about my little princess and how she is not a pit bull. Monday morning Indi and I were on our usual morning walk. On our street’s corner I saw a dog all curled up sleeping. So I approached slowly and sure enough the dog gets up. She was totally scared and her tale was between her legs. I threw a couple of treats at her and she ate them. In the mean time Indi was not too far leashed to the railing of a gate. So I was going to take Indi back to our house and come out and get this little dog. I was about to walk away and sure enough she approaches us with her tail wiggling. This gave me a chance to take off Indi’s regular collar and run the other side of the leash through it and then put it onto the other puppy’s neck and off we went back to the house. Poor little thing didn’t have a collar, was dirty and hungry. So we fed her, washed her, and let the little girls play together. We had the option of taking her to the animal shelter, but we decided against because just in case no one comes to claim her, then we all know what is going to happen. 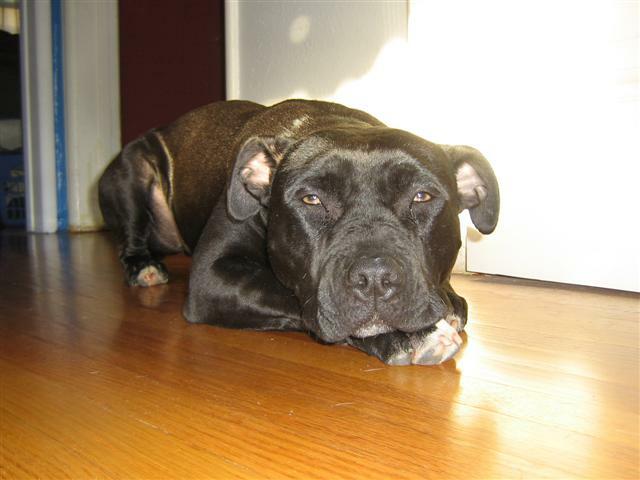 And she is a pit bull mix, so less people are inclined to adopt dogs like her. In the afternoon we went around our neighborhood and posted a bunch of Dog found flyers. As of today we have not heard from anyone. This is really sad. When we found her she didn’t have a collar and doesn’t have an identification chip because we went to the vet to make sure. Now how sad is this? I don’t understand why people would actually own a pet and not have a collar for them. Or even worst, don’t have an ID chip. It doesn’t cost all that much only $25 at the animal shelter. We have named her Onyx. She is really cute, very cuddly, has huge gorgeous eyes, makes a lot of eye contact, her coat is soooo nice and shiny. She is pushy and wants it her way, but in the couple of days that she has been here, she has realized that such behavior will not work around here. She is getting better every day. The only issue that we have is the fact that she is an alpha/dominant dog and snaps at Indi every so often. So it has been a bit crazy around here. There is some barking and some growling. We hope to find the owners if they are actually out there looking for her. We can’t keep her and if no one contacts use in the next couple of days we will have to find a rescue group that’s willing to take her. The picture above was taken a few days ago while my little puppy Indi and I were out for a walk around the trails. I may be partial, but I think she is beautiful and adorable. 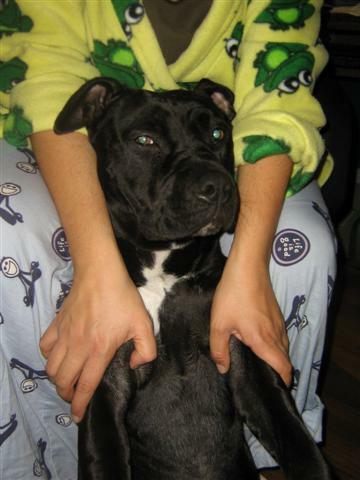 She is a seven month old American Staffordshire Terrier mix. Note: not a pit bull. I have grown rather tired of people who mistake her for a pit bull. She is automatically judged and people think that she is a ferocious dog who will kill them. I am so over this that I am flat out going to lay it down and say that people need to wise up a little and step out of their ignorance. Firstly, pit bulls look different; second, the reason why pit bulls have a bad reputation is because of their owners; third, showing fear and weakness around dogs is not going to help matters. I have been reading and educating myself about how to train our puppy and be a responsible dog owner. And the more I read, the more I am able to recognize dogs that are not centered and who are not given a structured life. Raising a dog is no different than raising a child. They need to be fed, taken out for walks so they are exercised, socialized with people and other dogs, trained, given affection at the right time, and monitored for possible aggressive behavior. Indi is a wonderful, sweet, vivacious, loving, and adorable little puppy. She has been a blessing in so many different ways. We are very happy that we picked her and brought her home with us. While she is a high energy dog, she is also very gentle and has a lot of love to give. She is a little puppy and needs a lot of structure. She and I work on her obedience commands every day. We are also in the process of learning new tricks. She has been known to occasionally chew on her bed, her bowl, and dig in our yard. But honestly, the reason is not because she is bad. She did all these things when she was bored and left alone without any time of stimulation. Because she is a high energy dog, we take her out on walks on a regular basis and she also loves to chase balls and other dogs at the doggy park. Indi is really good about playing with other dogs. She plays with all size dogs, small and big. She can play rough with high energy dogs like herself, or she can totally be gentle with smaller dogs such as puddle and Yorkshire terriers. OK, I am done venting! Until next time, please take the time to train your dogs! 1. I miss writing creatively…I have been writing many research papers for my graduate courses about linguistics stuff and frankly speaking I am so over them all. It heat me a couple of months ago how much I miss writing about literature or just simply writing for a creative purpose. 2. I have been reading more and more blogs about cooking and checking out recipes that people post. My favorite food blog that I visit regularly is Simple Recipes. There are a couple of more that I have been checking out here and there, and love the energy that the writers put into their blogs with awesome pictures and recipes. You probably wonder what Aglio and Olio means. For those who don’t speak Italian they respectively mean garlic and oil. For those who know me, it is no surprise that I would use food to name my blog because I love cooking. There are two ingredients in our household that are just staples. There is no cooking without them. 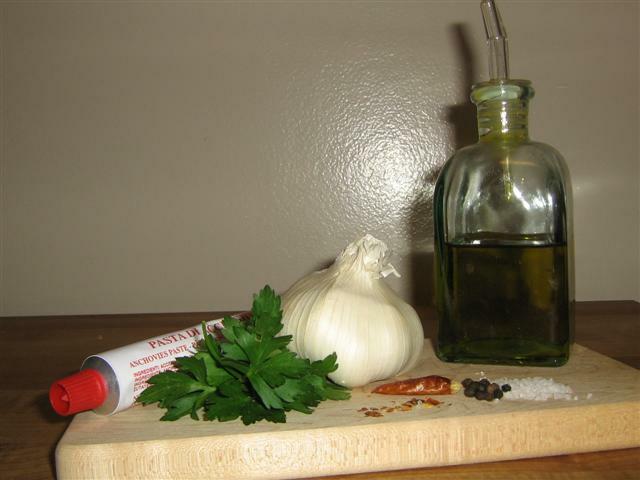 No dish that gets cooked by yours truly lacks these two wonderful, delicious, healthy ingredients: garlic and olive oil. These two are so amazing and of course popular in Italy that there is even a Spaghetti sauce named Aglio e Olio. This is the simplest type of sauce that can be prepared and I remember my mom making it often growing up. I have to say my relationship with garlic was not as intimate as it is right now. My parents don’t like the taste of garlic in their dishes. So what my mom does is simply flavor the oil with garlic by sautéing it for a few minutes in the oil. Then she takes the pieces out and throws them away. So I did the same thing. To be honest, I never even liked it when my mom made Spaghetti all’aglio e olio because it was too simple, and frankly, I never liked the smell of it. My love for garlic started growing more and more as I became a better cook myself and was introduced to international dishes through friends. And then there was that first trip to the Stinking Rose ten years ago. Wow was that a garlicky experience. The only thing that I could not handle was the garlic ice cream YAK!!! Anyway, the other day Jon said something really cool…well he says a lot of cool things…that is when he actually talks! He said that what makes a home “welcoming and homey” is garlic and olive oil. Isn’t that poetic?!! I loved it! It is only fair that I would post the recipe for Spaghetti all’aglio e olio as my first post. I must admit, I am not very good with measurements…I totally eye ball my ingredients; the only time in my life that I followed recipes verbatim was during my professional cooking course. So you can always add and subtract the amounts. Boil water and add salt and pasta and cook according to package directions. In the mean time, in a pan sauté garlic, anchovy paste, and pepper flakes in oil. Once the garlic starts becoming a light golden color turn off the heat. You can either leave the garlic pieces in your sauce or remove them. Toss the sauce with the pasta and add parsley, salt, and pepper. Buon Appetito! !